For introducing the new war technology, the world scientists misguidedly install the malware program in the robotic machines. Now robots machines are going to make confrontation with humanity and they are now ruling the humans of the grand city. Robotic machines takes the charge of the beautiful grand city in the Multi Eagle Metal Robot vs Robotic Machines action simulation. Gradually monster robots are increases in numbers and these vicious monster robots seems everywhere on the earth. If these things happens any more than we will find the humanity by a chance on earth. The scientists of the world also made a revolutionary change in the multi Metal Hero to save the humanity on earth. 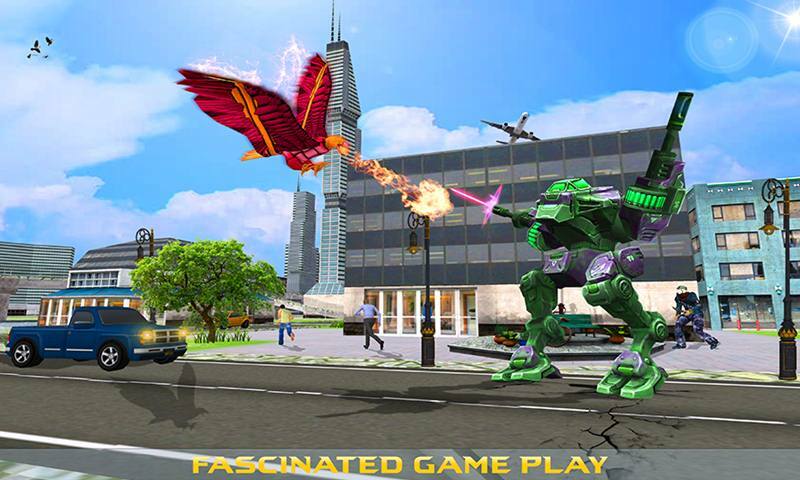 Enjoy the most demanding Multi Eagle Metal Robot vs Robotic Machines action simulation that especially designed for the technology and the robotic games and robot games lovers. Your favorite multi Metal Hero especially made with steel body and can transform into a robotic eagle bird. 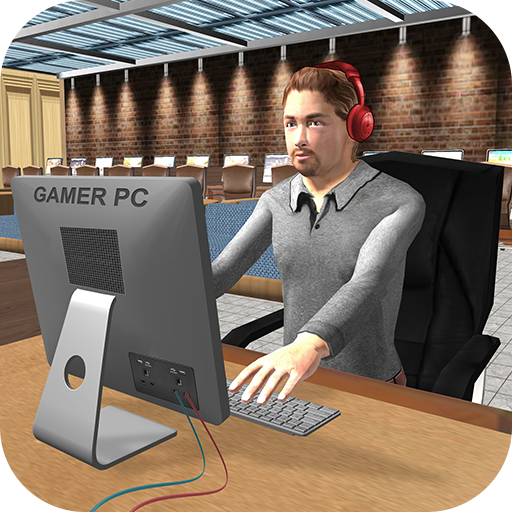 Appraise the angst feeling of the people of grand city they are moving towards the safe places because the attractive city is going to be intensity robotic battle filed. Amazing camera angles and realistic sounds effects made this game to the best robot game. 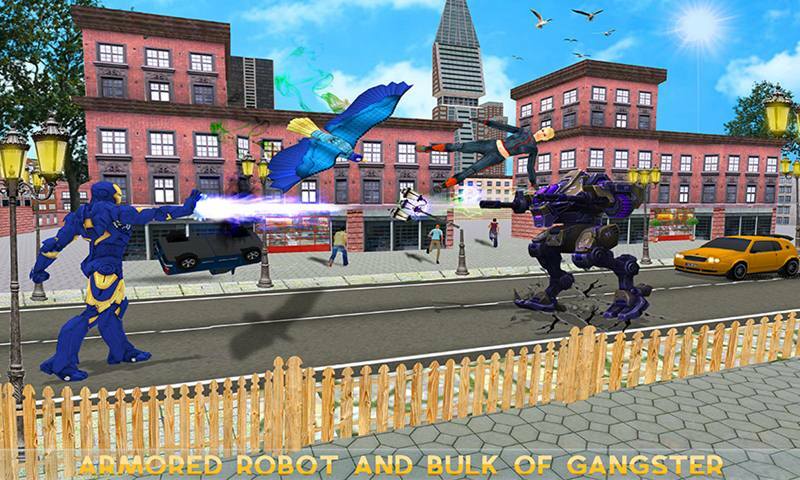 Multi Eagle Metal Robot vs Robotic Machines action simulator contains the futuristic battle missions with the monster weaponry machines and with the dangerous gangsters. 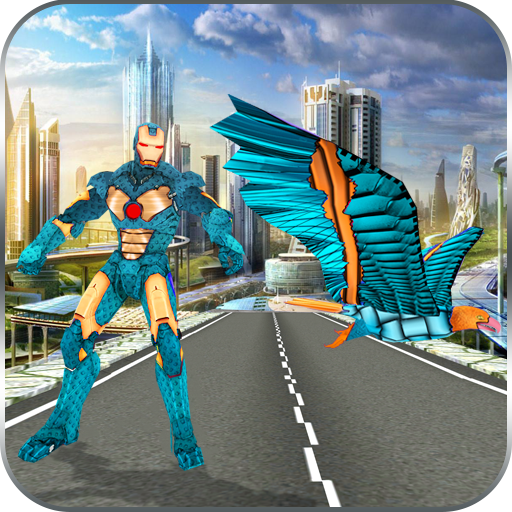 Choose your favorite multi Metal Hero with amazing robotic eagle bird against the dynamic robotic battle in the grand city. Playing as a multi Metal Hero, you can attack on the rival’s machines and upon the beast gangsters too with your ice firepower as well as with the nimble martial art combos. You also can transform in to robotic steel eagle, fly in the air of grand city to watch the vicious activity of the criminals as well as attack on them with the fires. These monster robotic machines contains the bulk of weapons inside them, and they are going to destroy the grand city. The brutal gangster are behind robotic machines. The rival’s robotic machines can attack with their double fire guns. Moreover, the agent mafia can attack on you with the powerful martial art combos. You have to show your multi-functional fighting skills and downfall your rivals as soon as possible. 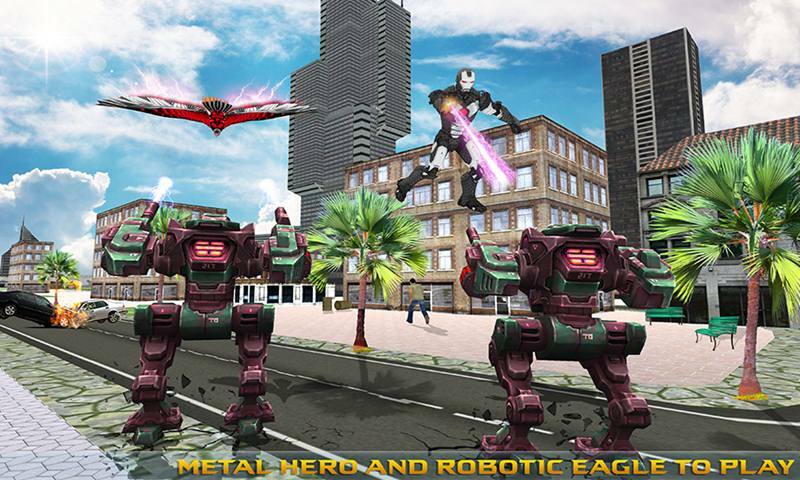 Get more score in this futuristic simulation so that you can unlock the other metal hero and robotic eagles. 3D city environment and realistic battle with machines made this game crazier. 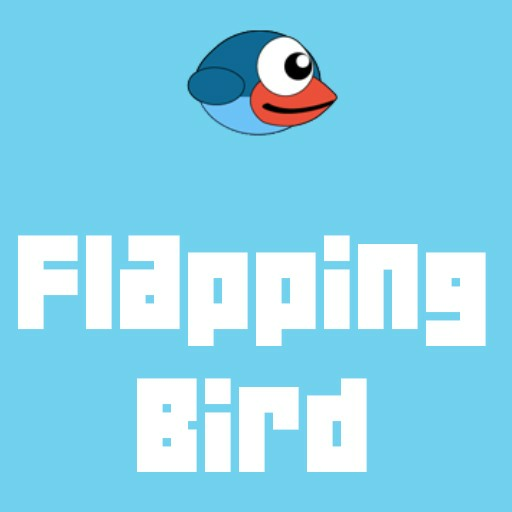 • Play as multi Metal Hero as well as robotic eagle too. • Robotic war machines and beast gangsters to fight. • Crazy transform from Metal Hero to robot eagle bird. • Amazing robotic eagle flying and fire attack. Get ready to control the fantasy of modern technology like, multi metal hero machine with arsenal eagle bird in Multi Eagle Metal Robot vs Robotic Machines action simulation will give you the amazing experience. 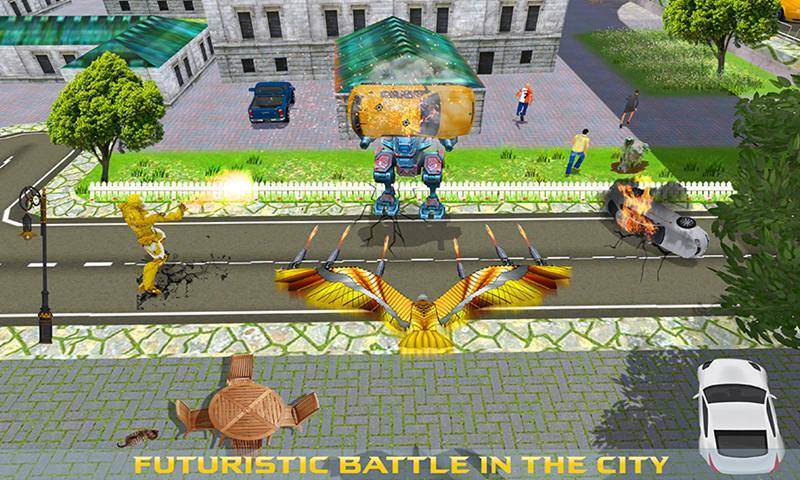 Fight with the war robotic machines will give you anxiety and breathtaking feeling while playing this robotic war game. Just grab the free Multi Eagle Metal Robot vs Robotic Machines action simulation and enjoy.